"Who Has Ears," "Eye, Ear, Mind," The Jesus Database, an online annotated inventory of the traditions concerning the life and teachings of Jesus. Dr. Gregory C. Jenks, FaithFutures Foundation. Augustine on the Parable of the Sower. "I tell you of a truth, my Beloved, even in these high seats there is both wheat, and tares, and among the laity there is wheat, and tares. Let the good tolerate the bad; let the bad change themselves, and imitate the good." "But Matthew means to say that these parables are of the nature that no one can understand them, they may grasp and hear them as often as they will, unless the Spirit makes them known and reveals them." "Christ shows in putting forth this parable of the sower, that the seed of life which is sown in the world does not do as well in one as in another, and the reason for this is that men for the most part, either do not receive it, or do not permit it to ripen." "Jesus entered into a boat that he might be the less pressed, and be the better heard by the people. By this he teaches us in the outward circumstances of worship not to covet that which is stately, but to make the best of the conveniences God in his providence allots to us..." "...Jesus entered into a boat that he might be the less pressed, and be the better heard by the people. By this he teaches us in the outward circumstances of worship not to covet that which is stately, but to make the best of the conveniences God in his providence allots to us." "Cares are thorns to the poor: wealth to the rich; the desire of other things to all." "These parables are These parables are SEVEN in number; and it is not a little remarkable that while this is the sacred number, the first FOUR of them were spoken to the mixed multitude, while the remaining THREE were spoken to the Twelve in private--these divisions, four and three, being themselves notable in the symbolical arithmetic of Scripture." "Sown Among Thorns; Mt 13:7, 22," Charles H. Spurgeon, 1888. "Preaching is the most idle of occupations if the Word is not adapted to enter the heart, and produce good results." "Whoever uses his opportunities will grow; whoever abuses them will lose them." "The Sower," Nancy Rockwell, The Bite in the Apple, 2014. "Redacting the Redactor," Russell Rathbun, Question the Text, 2014. "Sowing and Not Reaping," Alan Brehm, The Waking Dreamer, 2014. "One of the notions that drives religious perfectionism is the idea that obedience automatically brings rewards. But this pipe dream doesn't live up to reality. In fact, it oftentimes leads to discouragement and even bitterness." "Busting the Tiller," Rick Morley, 2014. Commentary, Matthew 13:1-9, 18-23, Elisabeth Johnson, Preaching This Week, WorkingPreacher.org, 2011. "As those entrusted with Jesus' mission today, we might consider the implications of this parable for how we engage in mission." Parable of the Sower, audio telling, story in episodes, graphic, audio and written commentaries. Go Tell Communications, Biblical Storytelling for the Global Village, 2011. "The story would have been shocking to many who heard it. There were many--in those days, and in ours--who most certainly did not think God had sown the seed of the word everywhere in the world." Holy Textures, Understanding the Bible in its own time and in ours, Matthew 13:1-9, 18-23, David Ewart, 2011. "You and I might not waste our efforts on the down trodden, the thorny, and the hardened, but God does." "The Guiding Ethical Hand of the Lectionary," Russell Rathbun, The Hardest Question, 2011. "Once you realize you cannot do a thing about the state of your soil, you turn and you are healed. "First Thoughts on Year A Gospel Passages in the Lectionary," Pentecost 5, William Loader, Murdoch University, Uniting Church in Australia. "The parable of the careless sower, the miraculous harvest, the helpless, hapless seeds, or the good soil? Which brand name(s) do you prefer? Whichever one(s) you pick, 'let's hear something we've never heard before.'" "What was Jesus seeking to threaten in the hearer's world of assumptions by which they habitually live?" "One of the encouragements I get from this start to Matthew 13 is the necessity to sow and harvest every year. We will fail with some seed, we do well with some seed." Commentary, Matthew 13:1-9, 18-23, Dale Allison, Preaching This Week, WorkingPreacher.org, 2008. "The Sower and the Seeds," Gospel Analysis, Sermons from Seattle, Pastor Edward F. Markquart, Grace Lutheran Church, Seattle, Washington. Detailed background and exegesis. "In this first parable of Jesus, he chose the most common of experiences from the everyday lives of people: ?seeds, sowers, hard paths, rocky soil, thorny soil, good soil.? These were as common as scenes as possible, but in the commonness, Jesus saw illustrations about God and his kingdom." Synopsis (English) and discussion by Mahlon H. Smith, Rutgers University. Focus is on textual origins and exegetical insights from literary relationships. "Unlike a pronouncement story, the details of this scene do not explain what Jesus says there. Note that Luke gives this parable in a different setting than Matthew and Mark." "In Matthew's logic, the characterization of hearers as slow to comprehend justifies Jesus' pedagogical practice of composing graphic parables. Yet, like a good scholar, the Christian scribe who composed this gospel also explicitly points out that this description of Jesus' audience parallels a passage in a previous scriptural text: Isaiah's characterization of his fellow Jews. Neither Mark nor Luke note this parallel." "Understanding Parables," Rev. Bryan Findlayson, Lectionary Bible Studies and Sermons, Pumpkin Cottage Ministry Resources. Includes detailed textual notes. "Suggest some practical ways the Lord my give an unclear word to a people whose ears have grown dull of hearing." "The Goodness of God," Larry Broding's Word-Sunday.Com: A Catholic Resource for This Sunday's Gospel. Adult Study, Children's Story, Family Activity, Support Materials. "How can waste and abundance described blessings in God's kingdom? How can we risk our hearts (like the soil in the parable) to receive God's Word (like the seeds)?" Wellspring of the Gospel, Ordinary 15A, Catherine McElhinney and Kathryn Turner, Weekly Wellsprings. Matthew 13:1-9, 18-23, at Austin Presbyterian Theological Seminary's An Exegetical Study of the Common Lectionary, coordinated by Prof. John E. Alsup, features rough translation, disposition, immediate context, broader context, hermeneutical bridge, and contemporary address. "This materialistic and commercialistic age in which we live chokes life out of us much too much for God's Word to bear much fruit through us these days. This parable can give us more realistic vision of the contexts in which we attempt to live our lives in faith." "Parables of Jesus," "Parable of the Sower," wikipedia. Achtemeier, P. Mark, "Matthew 13:1-23, Expository Article," Interpretation, 1990. Crossan, John Dominic, "The Seed Parables of Jesus," Journal of Biblical Literature, 1973. Gaventa, Beverly R., "Hearing the Questions," The Christian Century, 1993. Potkay, Monica Brzezinski, "The Parable of the Sower and Obscurity in the Prologue to Marie de France's Lais," Christianity and Literature, 2008. "Scattering Seeds," Jason Byassee, Faith and Leadership, 2012. It's Not About You; It's All About God, Mark Ellingsen, SermonStudio. "Why Jesus? Part 2: Jesus the Storyteller," Bishop William H. Willimon, Day 1, 2010. "God Is a Foolish Farmer," Dylan's Lectionary Blog, Proper 10A. Biblical Scholar Sarah Dylan Breuer looks at readings for the coming Sunday in the lectionary of the Episcopal Church. "The Reckless Sower," the Rev. Jim Somerville, Day 1, 2005. "The Sower and the Seeds," Pastor Edward F. Markquart, Sermons from Seattle. "Being a Bit Left of Center," 8 Pentecost - 10 July 2005, David Zersen, Göttinger Predigten im Internet: Every Sunday Sermons based on the RCL by a team of Lutheran theologians/ pastors. "The Seed within Us," the Rev. Ramona Soto Rank, Day 1, 2002. "...And the Seed Will Grow," Bishop George Anderson, Day 1, 1996. Good Ears -- Children's sermon based on Matthew 13:1-9, 18-23 from CSSPlus. 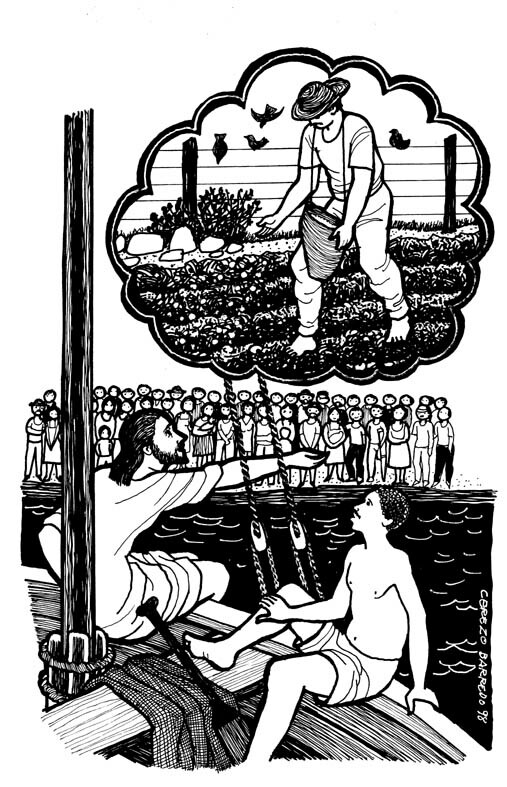 "The Parable of the Sower," Illustrating the Story (lessons, children's sermons), coloring pages, activity sheets, crafts, children's songs. MSSS Crafts. "It All Depends on the Dirt," Charles Kirkpatrick, Sermons4kids.com. "God Sows His Seeds Everywhere," Sunday School Lessons: Family Bible Study, art projects, music, stories, etc. "Seeds that Grow," Jim Kerlin, childrensermons.com. "The Parable of the Sower," online computer java-based coloring pages from Grace Baptist Church of Feeding Hill. "Parable of the Soils/Sower," Reader's Theater, Lisa Ann Moss Degrenia, 2012. "Drill Lesson," Andy Lund, dramatix. "Parable of the Sower," Steven Muir, dramatix. "Getting the Message," John McNeil, dramatix. Matthew 13:1-9, at Cerezo Barredo's weekly gospel illustration. Liberation emphasis. Hymns with Scripture Allusions: Matthew 13:3, 8, 23. The Cyber Hymnal.